I like short sentences. I also like long, rambling soliloquiies of prose that take you on a journey of twists and turns, of loops and curls, that almost (but not quite) lose you on their convoluted meanderings only to bring you back safely in to land; sometimes with a bump. Horses for courses, of course. A short sentence serves its purpose, as does a long one – the key is to know when to use each kind. This quote from 100 Ways to Improve Your Writing by Gary Provost explains it beautifully. Gary Provost is a name that I have only just come across, but I really think I ought to start reading some of his books. In this post on his website Provost says some things that are echoed in points made by Pinker in his new book, on which I commented in this post. Elements of Style is a small, ‘perfectly formed’ guide to English usage written in 1918 by William Strunk Jr. an English professor at Cornell University. He was moved to write his guide to “cut the vast tangle of English rhetoric down to size and write its rules and principles on the head of a pin,” (Strunk and White 2000: xiii). Half a century later, an erstwhile student of Strunk, E.B. White (of Charlotte’s Web fame) refreshed the original volume, updating some of the examples and adding a new chapter. Strunk enjoins us to write vigorously and concisely; to make every word count. He sets out the rules for what is acceptable in English writing and does so with passion and care. White picks up this theme in his added chapter, but he departs from Strunk’s almost formulaic approach and turns to confront the ineffable nature of ‘style’. He reflects that “There is no satisfactory explana- tion of style, no infallible guide to good writing … no inflexible rule by which writers may shape their course. Writers will often find themselves steering by stars that are disturbingly in motion,” (Strunk and White 2000: 66) before going on to suggest twenty-one principles that may serve as sextants for the brave and literate navigator. To the casual browser, the book might appear to be no more than the pithy diktats of a linguistic pedant: eleven rules of usage, eleven principles of composition, and some considerations on form and style. But I think that it is much more than that. It is a charming and impassioned treatise on the nature of good writing. It does not hector. It does not berate. It is confident and bold, but never claims dominion over the language. While Strunk clearly liked his ‘rules’, I prefer White’s conceptualisation of them as ‘principles’. The beauty of principles is that they are malleable and exist to serve a purpose within a context. This gives us permission to experiment and to make principled choices. 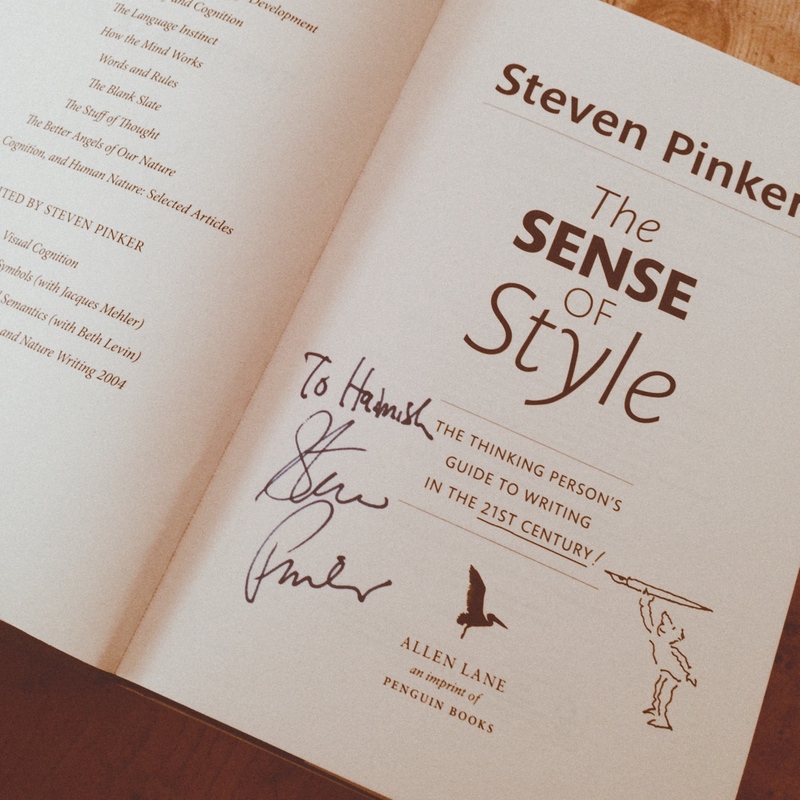 On Tuesday I went to see Steven Pinker talk about his new book The Sense of Style, the latest addition to the field of writerly advice. Pinker started his talk by acknowledging the place in people’s hearts that is occupied by Strunk and White, but also by noting that the younger author (E.B. White) was born before the turn of the century – the turn of the 20th century. Pinker’s ‘thinking person’s guide to writing in the 21st century‘ is intended to bring up to date the The Elements of Style‘s cherished exhortations and admonishments, so typical of of the genre. I have read only the first two chapters of the book so I will not attempt to summarise his message. For a feel for thrust of it, this article in the Wall Street Journal is as good a place as any to start – not least because it cites Hanlon’s Razor. I will, however, briefly discuss a couple of the points Pinker made in his talk that resonated with me. First was the notion of The Curse of Knowledge. This curse describes the situation in which possessors of knowledge find it extremely difficult, if not impossible, to conceptualise what it is like for people who do not share that knowledge. Pinker illustrated this by describing a psychology experiment where a three year old who is shown the contents of a box assumes that another three year old who has not seen the contents also knows what is contained in it. While this is an extreme example of the curse, which disappears with age, the principle nonetheless remains into adulthood. In the context of writing, this means that adults who are very familiar with their subject matter cannot adequately conceive of the principles of good writing needed to convey that knowledge to someone who knows less about it than them. This has important implications for anyone who hopes to add to collective knowledge through writing. Indeed, it has important implications for anyone trying to teach anything to anyone via any medium. It is very tempting to think that one’s reader possesses a similar level of knowledge to one’s self. But, implies Pinker, this assumption risks obfuscating one’s writing to the point of making it a waste of time for both writer and reader. This is troubling. If the curse of knowledge is so strong as to make it impossible for writers to put themselves in the shoes of their readers, what is one to do? Because writers can only know that their readers interpret the world differently to them, not to what degree and in what ways, perhaps the only thing to be done is to bear this continually in mind when writing. As a consequence writers might then steer away from technical vocabulary, or think twice about using complex turns of phrase, when the choice to be clearer presents itself. The point here was not to name call, but to show that the evolutionary process that language is subject to would have seen the passive voice whither on the vine if it did not serve some useful purpose. That Strunk, White and Orwell couldn’t even see that they were using the passive to warn against the passive is indicative of the evolutionary force of the device. Pinker went on to give a good example of why the passive can be important in keeping the reader’s attention focussed on the important things that the writer wants to say. Forcing the active voice for the sake of ‘keeping to the rules’ may result in syntax that is strange, unnatural or which otherwise leads to confusion, where clarity is the aim. Was it the vote that was immediate or the approval? Splitting the infinitive changes the meaning of the sentence, and in the second (split) rendering it is clear that the vote was for immediate approval (regardless of when the vote was taken). A true stickler might suggest putting the adverb at the end: “The board voted to approve the casino immediately”, but this hardly makes it any clearer. Also, given that word order helps to suggests the importance of elements in a clause, we might wonder whether it is the approval or the immediacy that the writers considers the focus of his message. I look forward to reading the rest of the book. But for now those three pearls of wisdom have been excellent food for thought. My last thought about the evening, however, is on the nature of Q and A in these kinds of events. Most people who asked questions were brief and to the point – and actually asked relevant, interesting questions. However, the nature of the final contributor to the discussion was a boring, self-aggrandising lecture, at the end of which he append the tag “don’t you agree?”. 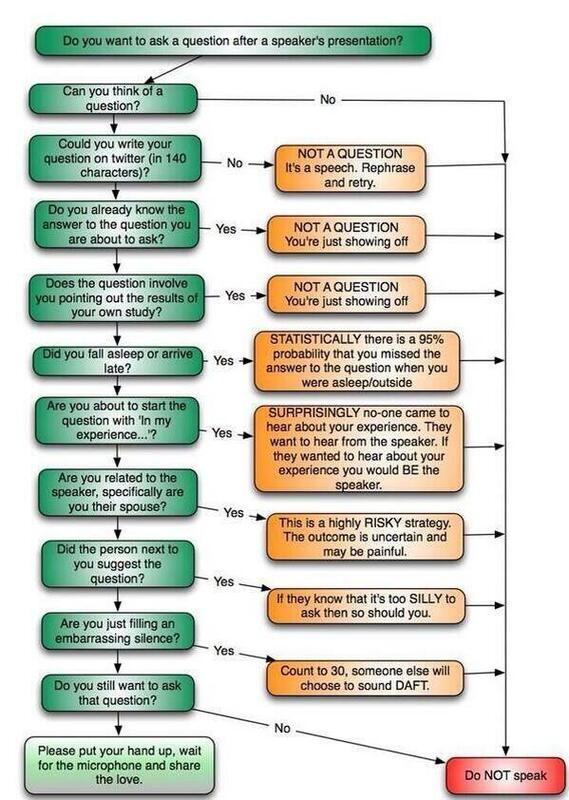 This slightly sour end to an otherwise brilliant evening put me in mind of this flow chart to help people decide whether to ask a question at a public lecture.